Soon after the release of mighty Samsung Galaxy S for customers, Samsung yesterday announced the upcoming Galaxy 3 Android phone at CommunicAsia Singapore. 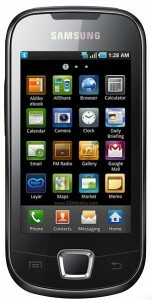 The Samsung Galaxy 3 is an Android 2.1 based phone with Samsung TouchWIZ UI 3.0 over it. There is nothing much to discuss about it features, but it would be the first Android handset to feature a WQVGA screen. The phone is designed to be in a mid-range below Galaxy S with basic social media connectivity and multi-media facilities. We have seen the UI of Samsung Galaxy 3 in several other Samsung phones. One of the features added to the TouchWiz 3.0 interface, the Social Hub will be available with Galaxy 3 Android phone. So apart from the several new features of Android 2.1, the Samsung Galaxy 3 will provide easy access to Facebook, Twitter and other social media apps, photo uploading websites, IM, Email and messaging services, etc. Samsung Galaxy 3 will include 3.2 inch capacitive touch screen with 240 x 400 pixels resolution and 16M color support. The device has accelerometer and other sensors for screen rotation and for operation of other related apps and games. The best thing is the it supports the multi-touch input feature of Android 2.1. This feature of Galaxy 3 on a capacitive touch screen will offer smooth web browsing and image viewing. Other features of Samsung Galaxy 3 include dual band 3G-quad-band 2G, 3.15 MP camera with auto focus and video recording at 15fps, WiFi, A-GPS, Bluetooth A2DP, DivX playback, 3.5 mm audio jack, Samsung DNSe, long lasting 1500 mAh battery, document reader, FM radio, 170 MB internal memory and up to 32GB expandable card slot. The very recently announced Samsung Galaxy 5 Corby has a price of $230, and will go on sale from this month. The Galaxy 3 will be available in Europe and Asia by July 2010. It would certainly cost more than Corby Android, say around $280-320.